Galleria Lorcan O'Neill is delighted to announce an exhibition of new paintings by Francesco Clemente. Works are on display in both the gallery spaces. On show are six new large paintings, portraits of women called Winter Women.The dark colouring, the lineaments of the faces, the attitudes all depict the complex inner workings of the female world, the fears, fantasies and delusions. The works represent strong energetic women which, through the detail and attributes entailed in the portraits, are an allusion to the tradition of classic art of the past and give a nod to the great masters, amongst whom we recognize Caravaggio and Picasso. These works, done on two separate panels in differing contrasting materials, linen and felt, are a physical interpretation of opposites joining into a single entity like man and woman, black and white, summer and winter. Also on display are five self-portraits, Summer Self, exhibiting a new intensity of colour, which reflect the light of the summer sun, like a psychological awakening. Clemente has always made self-portraits, commenting that, "A self-portrait is a way to register the constant appearing and disappearing of the self". Clemente's self portraits are a poetic search for truth, a distinct hallmark of his work. A self portrait becomes a form of self analysis, looking into oneself deep within one's soul, and, at the same time, it communicates to the outer world the artist's own style: "He who sees himself in all things is at the same time all things(Giordano Bruno, De imaginum compositione, 1591). Francesco Clemente has two other important exhibitions this summer: at the SCHIRN KUNSTHALLE in Frankfurt, opening 8th June called Palimpsest, a retrospective of one work from each year of Clemente's career spanning almost 40 years. The other is at the UFFIZI in Firenze called Tarot, an exhibition of 78 works on paper based on the Tarot, and a series of 12 oil paintings of the artist as each of the Twelve Apostles. This show opens on September 8. Born in 1952 in Naples, Francesco Clemente has lived in New York for more than 25 years, while working for extended periods in Madras, India. He works in many different media, including oil, pastel, watercolour, fresco, sculpture and printed books. The artist has collaborated with several poets including Robert Creeley and Allen Ginsberg. 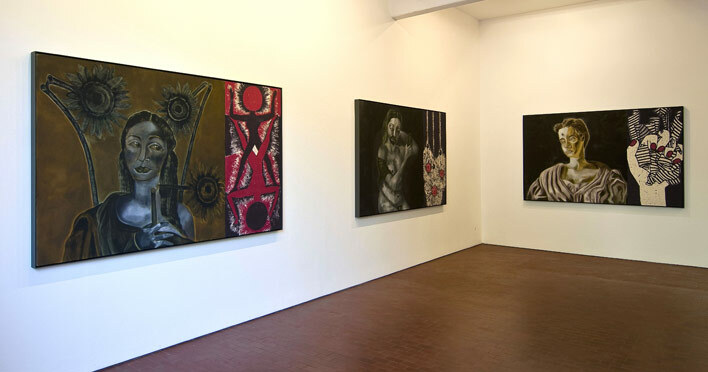 Clemente’s art has been shown in numerous solo and group exhibitions. Retrospectives have been organized by the Sezon Museum of Art in Tokyo (1994), Solomon R. Guggenheim Museum (1999), Museo Archeologico Nazionale di Napoli (2002-03), and Irish Museum of Modern Art in Dublin (2004).